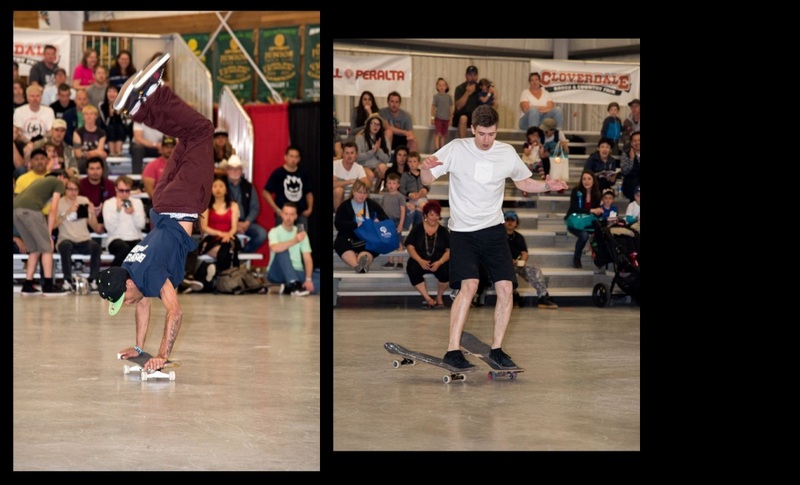 There was a different vibe at the 7th annual World Round-Up Freestyle Skateboard Championships held at the Cloverdale Rodeo & Country Fair in Surrey, BC, Canada. It was almost as if everyone there really wanted to win. With the best Freestyle Skateboarders flying in from all over the world, you would figure winning is always priority number one. But in past years it has had way more of a family/community feel to it, and everyone was just stoked to be there together and have fun. Now that the contest has hit its 7th year, some of the older veteran skaters have stopped coming, or stopped competing anyway, and there has been somewhat of a generation change. 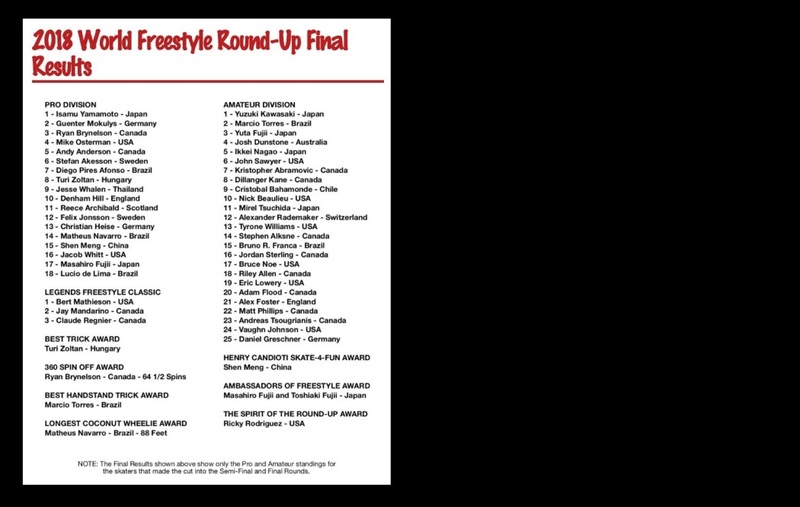 In the past it was freestyle legends like Guenter Mokulys, Per Cangaru, Masahiro Fujii, and Stefan Lillis Akesson that everyone would be trying to beat, but now it’s the youngest members of Freestyle that are the ones to watch out for. Isamu Yamamoto from Japan has been the person to keep your eyes on for the past four years since he showed up for the Amateur contest at age 11, and now at a mere 15 years old he is the one every competitor knows they need to try and beat. Isamu is a protégé of the Fujii Brothers (Masahiro and Toshiaki Fujii), and his skill level on a skateboard is way over the top. Left: 5th place amateur, Ikkei Nagao. Right: 3rd place amateur, Yuta Fujii. Photos by Jim Goodrich. Since Isamu jumped up to the Pro division a couple years ago, a few more of these young Japanese wonders have been controlling the Amateur contest. Last year Marcio Torres from Brazil battled it out with an 8-year-old Yuzuki Kawasaki (and barely beat him), and this year came down to the two of them again. Marcio’s runs are choreographed to perfection, and he always performs with a smile, even when he’s upside down. But the now 9 year old Yuzuki has the skills to pay the bills, and when you’re that small-statured it makes everything look so much more difficult. Between Yuzuki and the two 12-year-olds, Ikkei Nagao and Yuta Fujii, you would think the Amateur contest was made for kids, but there were guys in their 30’s in there too doing everything they could to try and compete with these young Japanese phenoms. 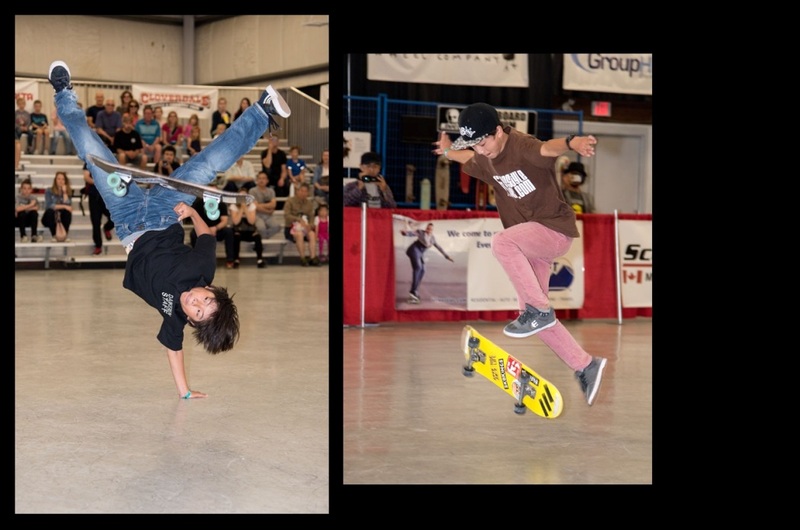 From thirty one competitors in the qualifiers down to only fifteen at the Sunday Finals event, it was definitely a battle for survival- but when the day was done, Yuzuki Kawasaki was named the winner and Best Amateur Freestyle Skateboarder in the World! Left: 1st place amateur, Yuzuki Kawasaki. Right: 2nd place amateur, Marcio Torres. Photos by Jim Goodrich. The Pro division was even tougher, of course. As mentioned, the mentality in all competitors was simple: beat Isamu! Well, if you know anything about Isamu Yamamoto, it’s that on any normal day he is either skateboarding or sleeping. Isamu won the Pro division last year, and since then has been travelling the world being featured on television shows, filmed for YouTube videos, and even performed for some high political figures. His work ethic shows in his skating; you can tell how hard he practices by watching him for just five brief minutes. With a couple new faces in the Professional category, it was anyone’s game. Turi Zoltan and Sto Strauss might have been first- timers to The World Round Up contest, but both have tons of experience in Freestyle competitions. Turi was in 4th place going into the Finals, and definitely let the world know how highly skilled and consistent he is, but he couldn’t quite push through in the Finals to win it all. 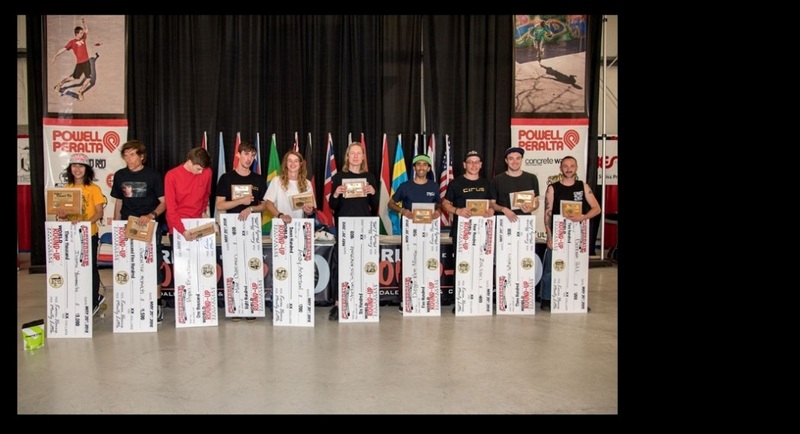 Many people had flawless runs in the Pro Finals (putting on an amazing show for the audience), including Guenter, Lillis, Andy Anderson, and Canadian Ryan Brynelson. Left: 5th place pro, Andy Anderson. Right: 4th place pro, Mike Osterman. Photos by Jim Goodrich. 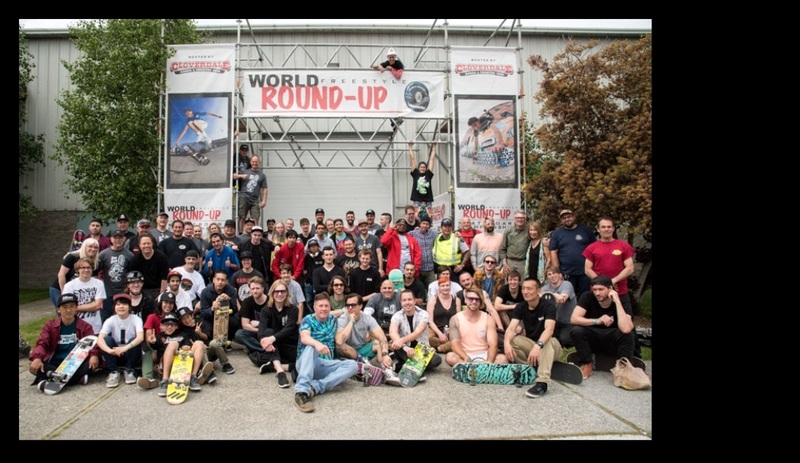 Ryan has been a part of The World Round-Up since day one. Learning most of what he knows about freestyle skateboarding from the Canadian Legend himself, Kevin Harris, Ryan put on an amazing performance mixed with smooth flowing wheelie tricks, handstands, technical stationary maneuvers, and some of the fastest and most controlled 360 spin moves of all the competitors. 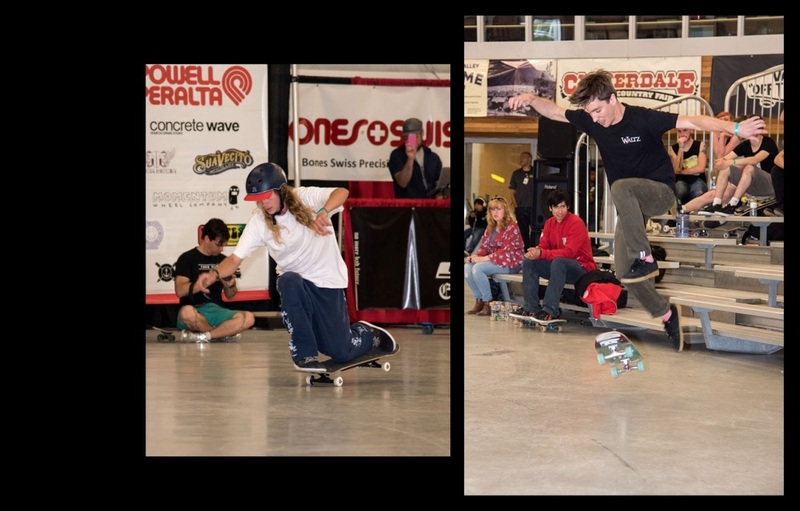 Ryan took 3rd Place in the contest and was super stoked; he also won the 360 spinoff competition the next day. Left: 7th place pro, Diego Pires. Right: 3rd place pro, Ryan Brynelson. Photos by Jim Goodrich. So it came down to two legends from two completely different eras, Guenter Mokulys and Isamu Yamamoto. At age 54, Guenter has been around the planet competing and doing demos his whole life and is the 11-time world champion… but could he beat a 15-year-old? With two flawless runs, showing off so many unique and powerful moves, Guenter received the utmost respect from the crowd, the judges, and the other competitors, but wasn’t quite able to win it all. Left: 2nd Place Pro, Guenter Mokulys. Right: 1st place pro, Isamu Yamamoto. Photos by Jim Goodrich. Isamu came out in Run 1 with power, skill, and insane speed; when you add in “perfection”, it backs up his case of why he should be known as “The Best Freestyle Skateboarder in the World”. This kid is unstoppable, and almost never misses any of his tricks. Mind you, he did bail in the beginning of Run 2… but instead of crying about it, that was the moment when Isamu Yamamoto made sure everyone around knew his name, getting back on his board, and throwing down combo after combo at such a high rate of speed he should have been pulled over by the cops. The look on every competitors’ face after his second run was a mix of astonishment and fear, and all were left speechless. It is obvious that Isamu is a freestyle skateboarding machine. So put your hands together for this amazing kid from Japan, Isamu Yamamoto– repeat winner of The World Round-Up Pro Division! The winners in the pro division, left to right, first through tenth. Photo by Jim Goodrich. Note: The Final Results shown below show only the Pro and Amateur standings for the skaters that made the cut into the Semi-Final and Final Rounds.